Want to see anything when you dive into caves? Explore shipwrecks? Dive at night? You’ll need a scuba diving light for all those activities. What type of lights do you need? What are the best scuba diving lights out there? Read on to find the answers to all your questions about dive lights. When should you use a scuba diving light? Diving 30 feet or more from the surface. It’s pretty simple. The farther down below the surface you go, the darker it gets, and at about 30 feet, it’s simply too dark to see anything. 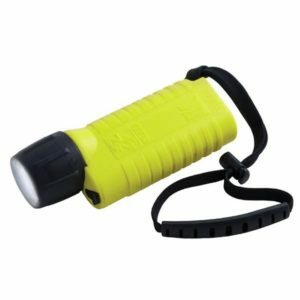 Exploring any caves or shipwrecks (anyplace that blocks out sunlight), you’ll need a light. Diving at night. Otherwise, you won’t be able to dive safely—let alone enjoy your dive. This is the workhorse of your diving light setup. It will be your primary source of light in the depths and your best friend. Without it, you’ll have a hard time getting around when you’re diving deep. Primary lights tend to be more expensive than all other types of lights, and for good reason. 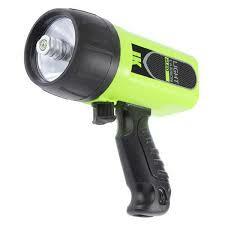 They’re way more powerful than your backup dive light, emitting brighter light to farther distances. They also have longer battery life and tend to be more rugged, so they’ll last you a long time in the water. 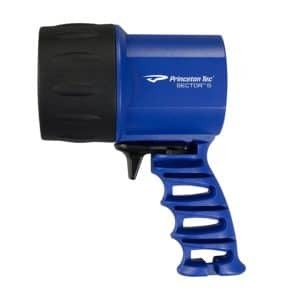 Primary dive lights come in either pistol grip or lantern grips. One last thing to consider when purchasing a primary light: How turbid is the water you’re planning on diving in? That is, is it cloudy or is it relatively clear? Cloudy water poses a challenge to powerful dive lights, since they can illuminate all the water and particles right in front of your face but will leave you blind to everything further out (kind of like using your car’s high beams in the fog.) 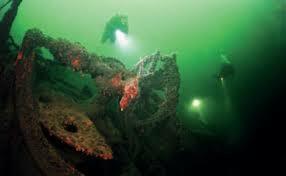 In cases of cloudy water, you best bet is to get a dive light that emits a very narrow, focused beam, rather than a wide angle, dispersed one that sprays light in every direction. 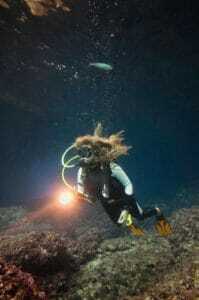 Also called a back up light, a secondary light is used primarily during night dives, in case your primary light fails. Having a reliable secondary light is imperative for good diving safety during night dives. Because it’s mainly used as a backup, secondary lights tend to be cheaper and less powerful. You’ll want to invest the bulk of your light budget in a good primary light, and use whatever is left over for a secondary. You still want something that will hold up well, but you don’t need it to be a high performing light like your primary. You use a primary dive light to see in front of you, a secondary in case the primary fails… so what do you use a dive beacon for? 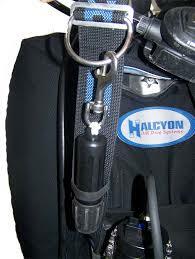 A dive beacon doesn’t help you see in the water, it allows other divers to see you. Although they emit a relatively small light, dive beacons can be visible for great distances underwater, allowing your diving partners to spot you even if your other lights are turned off. 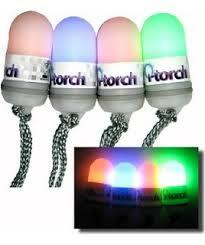 Dive beacons are usually similar to glow sticks, and just like glow sticks, they’re only good for one use. These are for illuminating scenes for your still and video photography. Other dive lights won’t do a good job of producing legible photos and videos. So if you’re interested in underwater photography, it would be good to invest in a camera light. The unfortunate thing about camera lights is that their use is limited. They’re only useful for using cameras, and not to be used as an actual dive light. 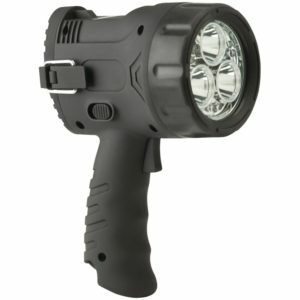 From one of the most reliable light makers in the world, this is a solid choice for a mid range, pistol-style grip dive light. 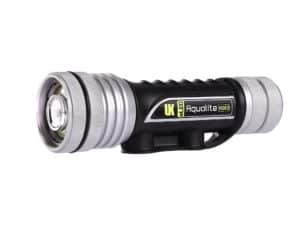 Although it’s a little underpowered in the lumens department (compared to similarly priced lights), the unit makes up for it in durable reliability. This is a great choice for a primary light, although it’s one of the most expensive on the market (unless you can find it on sale.) You won’t be disappointed with the durability (although it does make the unit quite heavy.) It comes with three brightness settings, the highest of which shines at a blinding 2,000 lumens! Where the C4 really shines is in the battery life department. The manufacturer says that one set of batteries will last up to 8 hours with the light set on high—although some users have reported the batteries lasting much longer. The downside to this awesome battery light is a relatively underpowered light. The light tops out at 185 lumens on the high setting. It’s durable and long lasting, but there are more powerful models available if that’s what you’re looking for. This Tonelife model is another good midrange option for a primary dive light. 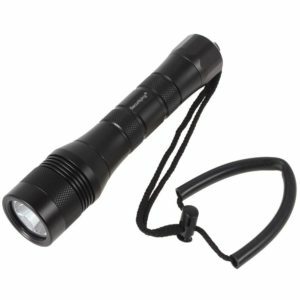 It has a good lumens output (1,000) and is quite durable. 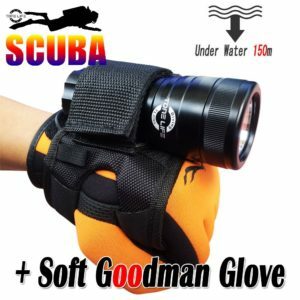 What sets it apart from similar lights is that it comes with a diving glove and mount, so that the light can be mounted to your glove while you dive. The glove mount is a neat innovation, since it leaves your hand free to do other things while still providing light. It’s also quite nice not to have your light dangling off a wrist lanyard while it’s not in use. The glove does introduce complications, however. To turn the light on and off, you need to twist the top part of the light; with the light strapped into the glove, it makes it hard to do this, forcing you to either wrangle with the light while it’s strapped in, or unstrap it every time you want to turn it off. 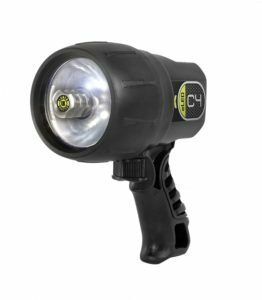 With this issue, coupled with the increased price tag due to the glove, you should probably investigate other lights, unless you really are enamored with the idea of a glove mounted dive light. 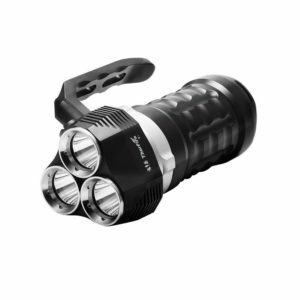 Like the ThorFire 2,000 lumen model, this ThorFire unit is very durable and gets the job done. It even comes with a lanyard to attach to your wrist, as well as rechargable batteries. Is this a primary or secondary dive light? These designations are somewhat subjective, and depend on how often you dive, the conditions in which you dive (clear or cloudy water? Night dives or day dives), and how much you’re willing to spend on your diving setup. 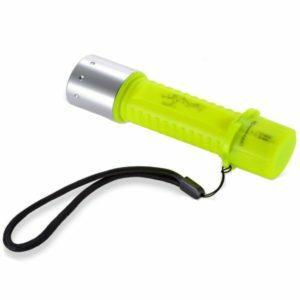 This unit is small and light enough to be an awesome secondary but also a great primary for a beginner diver. However, the specs on this light are a little misleading. 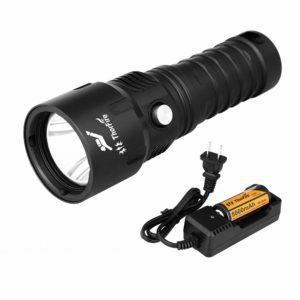 Although it can emit light at 400 lumens, it can only do so for a few minutes, before the batteries buckle and the light goes down to 200 lumens. Keep that in mind while making your purchase. Frankly, there are better value dive lights out there. While the specs on this dive light put it at 1,000 lumens, it probably isn’t that spectacular. (In fact, I would be sceptical of any advertising for a light at this price point that says it emits over 750 lumens.) With that said, this is a fantastic light. It’s definitely brighter than many of this mid-range priced dive lights. Highly recommended for beginners looking for their first primary dive light. This Orcatorch model is very similar in design to the SecurityIng model above. 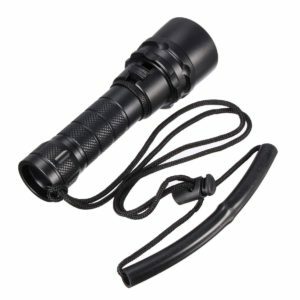 They also have about the same amount of lumens, and are of comparable durability. Unfortunately, the Orcatorch is much more expensive. Unless you find a great deal on this model, I would skip it for the SecurityIng model. This small and durable model from Goldengulf would make a great secondary light. 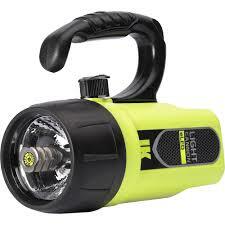 It comes in two options, the 1,000 lumens or the 1,800 lumens model. The 1,800 lumens model would even make a decent primary light. A solid secondary light, this model from Goldengulf isn’t powered by disposable batteries. It has a rechargeable battery you can charge in a power outlet. Personally, I think this is much more convenient than using disposables (you don’t have to go out to the store to charge it up), but many people don’t want to have to remember to charge it overnight. Whichever method you prefer should factor into your decision while purchasing a secondary light. One of the few secondary lights with a pistol grip. The 240 lumens mentioned on the specs are probably inflated; 160 lumens is probably a more realistic measurement for this model. All in all, the Cyclops is a solid choice for a secondary light, although you can get a more powerful light at a similar price in other models. 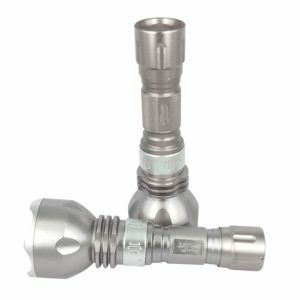 While the BlueFire XM-L2 is one of the cheapest dive lights out there, it’s not a cheap thing that will break after the first use. Sure, the 1,100 lumens listed on the packaging is a little exaggerated (if it does go that bright, it probably only lasts a few minutes before settling back to a more realistic light level) and it probably won’t last as long as more expensive lights. But at $15, it definitely gets the job done at a reasonable price. Finally we get to the lights for diving cameras. These lights set themselves apart by being able to be mounted on top of a camera, and also by having a wide field of illumination, big enough to brighten most of the field of the camera’s view. The Underwater Kinetics model is one of the best camera dive lights out there. Durable, long-living battery, and enough light to make your pictures and video look professional. 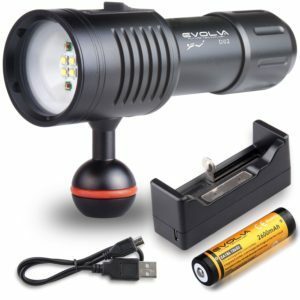 At half the price of the Underwater Kinetics light, this Evolva Future model is definitely a step down. The battery life doesn’t last as long, and the build seems slightly flimsier. It still is a bright light that will make your pictures look good. 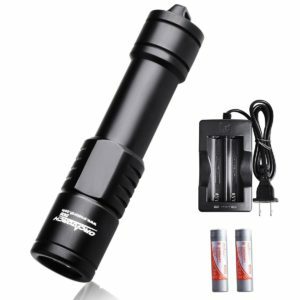 So if you don’t want to spend $100 for a dive light, this is a great, cheaper option.